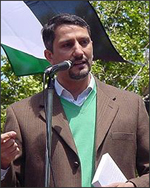 On May 9, Hatem Bazian, a senior lecturer in Near Eastern and ethnic studies at the University of California, Berkeley and anti-Israel activist, brought his power point presentation back to UCI. If you read my posting about Omar Shakir's presentation earlier in the week, you know what Bazian's presentation was all about: yet another recitation of Israel's "oppression" of the Palestinians. Bazian stood at the podium with his laptop and the slides appeared on the screen with all the stats. It was all there: the number of Palestinians killed by the Israelis; the number of arrests; the check points; the settlements; the wall. Of course, no data was given on the number of suicide attacks by Palestinians against Israelis, which have been drastically reduced in recent years by the wall that Bazian and other anti-Israel activists demonize. Similarly, he mentioned neither the massacre of the Fogel family in the settlement of Itimar in 2011, nor the number of rockets lobbed into southern Israel from Gaza. Predictably, Bazian (as is his wont) took a couple of slaps at Congress and George W Bush. (Bazian doesn't like Republicans). During the Q & A, I asked him if he presented his students with similar information in the classroom. Bazian replied that when he was giving the Palestinian narrative, he gives the Palestinian narrative. When he gives the Israeli narrative, he invites the Israeli consul to deliver it. I told him that, if this is how he teaches, his students receive a one-sided view. The last "question" was from local activist Shaheel Syed, who apparently arrived with Bazian and asked him to comment on the amount of American aid given to the "Zionist Apartheid state of Israel." Bazian obviously knew the question was coming because he had his answer prepared in the form of a six-point response. Hatem Bazian is a propagandist who takes his personal politics onto the UC Berkeley classrooms. He and his supporters cannot abide that America supports Israel. At noon on Wednesday, May 9, Holocaust survivor Hedy Epstein once again appeared at UC Irvine during the Muslim Student Union's "Palestine Liberation Week". Epstein, born in Germany in 1924, was part of the so-called Kinder Transport whereby thousands of Jewish children were sent to England during the late 1930s. Her family remained in Germany and died in the Holocaust. Epstein travels the world giving pro-Palestinian speeches. She is an ardent critic of Israel and says that she and her family have opposed Zionism since she first heard about it as a child. As in previous years, Epstein told her story about surviving the Holocaust and late in life becoming involved on the Israel/Palestinian conflict after the Shaba and Shatila massacres in Lebanon during the 1980s. She spoke of her initial trip to Israel with Palestinian activists and having to endure Israeli checks—including a strip search at the airport in Israel. Epstein opened her talk by mentioning a petition that is being circulated demanding University of California (UC) president Mark Yudof's resignation in response to a letter he recently issued deploring racist and anti-Semitic incidents on UC campuses. (He didn't mention anything about Islamophobia.) After her presentation, she signed the petition. Epstein also brought us up-to-date on her recent activities, including her participation in a flotilla boatlift to Gaza a couple of years ago, in which the boat she was on was stopped by Greek authorities just after leaving a Greek harbor. During the Q & A, a gentleman identified himself as the child of Holocaust survivors and politely told her that she was sharing a platform who supported Hamas and Hezbollah and thus, supported people who wanted to destroy Jews. In her response, Epstein said that she condemns all violence, but that the violence carried out by Palestinians pales in comparison to that carried out by Israel and the Israeli Defense Force. She also reminded the questioner that Hamas was elected by the people of Gaza, as if a government, but virtue of coming to power through an election, cannot be held responsible for terrorism committed in its name.